The Queenstown Story, Cobh Heritage Centre is in the midst of another successful summer with the number of tourists visiting the iconic museum set to reach a record high this year. Almost 72,000 visitors walked through the doors in 2017 which this year set to surpass 78,000. Cobh Heritage Centre opened in 1993 in the Restored Victorian Railway Station. The Centre contains exhibitions on emigration, military history and maritime history as well as features on the British Cruise Liner RMS Lusitania which was sunk off the coast of Kinsale during the First World War and the ill-fated RMS Titanic. The success that Cobh Heritage Centre is currently enjoying is bolstered by the range of tourist attractions in the vicinity, such as Spike Island, Europe’s Leading Tourist Attraction 2017 together with the increasing number of cruise liners into Cork Harbour. Cruise ships not only bring their passengers directly into the heart of Cobh but have in themselves served as a tourist attraction, encouraging people across Cork to visit. Cork County Council intends replicating the success of Cobh Heritage Centre and Fortress Spike Island elsewhere in Cork Harbour with plans to further develop Camden Fort Meagher, Crosshaven. 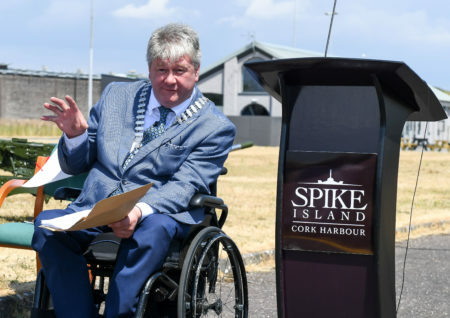 Mayor of the County of Cork Cllr Patrick Gerard Murphy, speaking at the 80th anniversary handover celebrations at Spike Island, Cobh, Co Cork in July 2018. Boats for Spike Island leave from Cobh. Cobh has the potential for greater tourism numbers. Chief Executive Tim Lucey in welcoming the increase in numbers noted how various tourism initiatives are paying dividends for communities and business across Cork.